Facebook’s “Trending Topics” section is at it again. Saturday morning the site ran a headline in the section declaring, “Colin Powell: Former Secretary of State Confirms He Recommended Using Personal Email to Hillary Clinton.” The only problem is Powell made no such declaration and he denied Clinton’s claim. The only problem is it didn’t happen. Colin Powell denied Clinton’s claim he recommended she use private email. The “story” Facebook labeled as trending wasn’t a story at all. It contained no link to a news outlet backing up its claim with substantiation or sourcing. It mentioned the New York Times, but only in reference to Clinton’s original claim, which Powell denied. Do You Think Facebook Employees Responsible For This Should Face Internal Discipline? Thanks for participating in this survey, in order to vote you must register with your email address. Clinton not only exclusively used private email for all her communications as secretary of state, she took the unprecedented step of setting up her own private email system and server which kept all of her communications with anyone not using an official government email address off the government grid, shielding them from Freedom of Information Act requests. 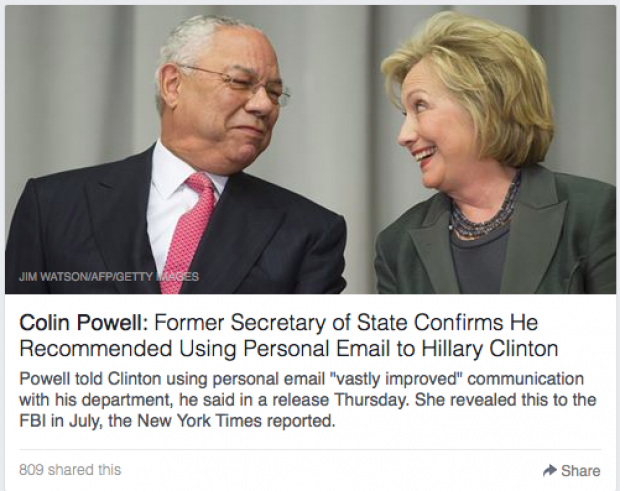 The Facebook story makes no mention of this or that Clinton’s shadow email system contained classified material, something Powell’s statement explicitly said he used a secure State Department computer to handle. When the story broke that Facebook was manipulating the news its users saw, the company denied it, although they did convene a meeting with conservative news organizations and promised to change practices.